Since I started writing about the London Underground, I've seen loads of polls about who are the most annoying commuters. The type that top the polls (or are at least in the top three) time after time are people playing loud music on their personal walkmans, mp3's & now iPods. So it's no surprise the latest poll by Jetsleeper has loud music players at number one, but I was slightly surprised at number three - "the early morning or late night traveller found asleep and leaving a trail of dribble on their neighbour's shoulder." I'm sure this is poetic licence on the part of Jetsleeper or thelondonpaper who reported it last night. Falling asleep I don't doubt, but seriously how many people do you see dribbling in their sleep on the Tube? 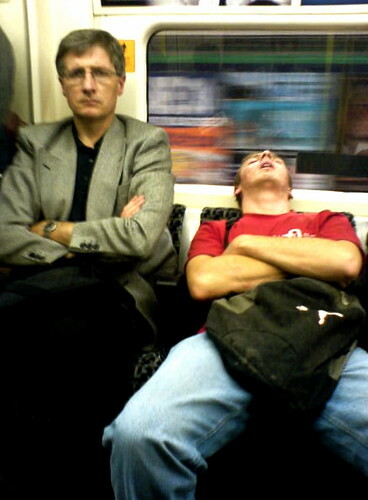 I've taken a fair few pictures of people asleep on the Tube in my time. So have others like Chutney Bannister & Mike - with the rather cheeky one below - which is reality isn't as bad as it looks! But in both pictures the guys sleeping have managed to hold themselves upright and not dribble on someone's shoulder. 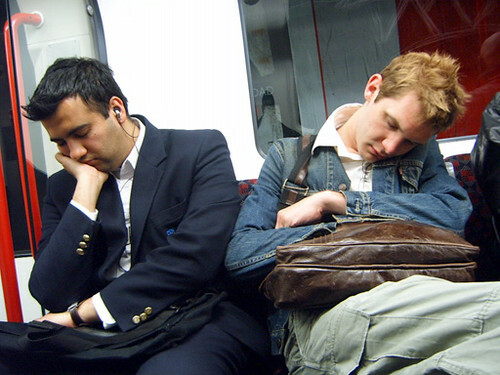 There's even a Facebook Group of pictures of People who fall asleep on Public Transport. I've not looked through all 100 odd pictures, but certainly after the first 50 there were none of people dribbling on other people's shoulders. 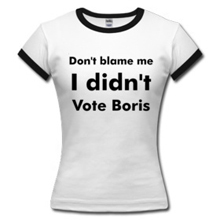 Maybe we just don't travel on the right lines and perhaps there's a special section of London which has a bunch of narcoleptics with saliva problems in it. Who knows? So who would top your poll for the most annoying commuters? Answers welcome in the comments.